Scotland, a land already noted for rivers flowing with whisky, is taking drinking to new heights. Literally. As in 150ft off the ground. Whisky masters Whyte & Mackay have opened a tiny pub dubbed The Lion's Clyde inside the wheelhouse of the century-old Titan Crane in Clydebank for this week only. 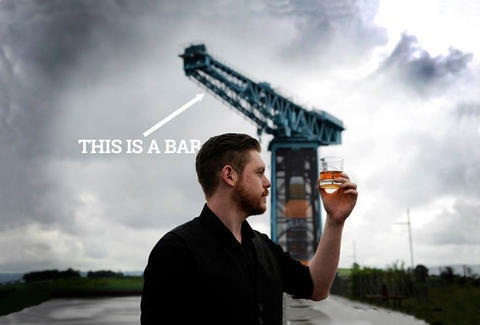 Like most bars dangling 150ft above the ground, The Lion's Clyde requires pre-booking (via the Whyte & Mackay Facebook page), but your reservation gets you a complimentary taxi and one hour in the space with up to seven friends. Vertigo is also complimentary. Kristin Hunt is a food/drink staff writer for Thrillist, and does fear heights, so she will be drinking her whisky elsewhere. Follow her at @kristin_hunt.